James Alistair Sinclair Nixon (Jim) passed away peacefully at The Moncton Hospital on Wednesday, December 5, 2018. He was born June 3, 1938 in Saint John to the late Josephine (MacPherson) and Guy Nixon. Predeceased by his sisters, Ruth Nixon and Jean Ross; his brother, Guy Nixon and poor old Cob. Jim was a graduate of the Saint John High School. After school, Jim joined the air cadets and gained a private pilot's licence in 1956. Subsequently, he joined the Canadian Air Force as a pilot and flew with them for a number of years. After leaving the Air Force, he worked as an Air Traffic Controller for 35 years. His other passion was sailing and he was on the district and national bridge of the Canadian Power & Sail Squadron for many years. He taught many courses for CPS and he was given the Atlantic Region Instructor of the Year award in 2017. 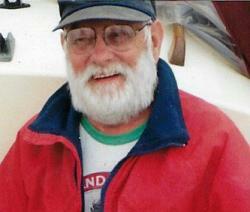 He was a director of the Pointe-du-Chêne Yacht Club, a Kinsman and a member of Probus. He will be missed by his many friends in both the sailing and air traffic control community. He is survived by his partner of many years, Judy and two stepchildren, Jacki and Clive and Penny the cat. His nieces, Wendy Bennett, Catherine Price and Janet Graves and nephews, Terry (Lena) Nixon and David Ross. A Service to celebrate and honour Jim’s life will be held at Fergusons Funeral Home Chapel, 1657 Mountain Road, Moncton (858-1995) on Monday, December 10, 2018 at 1:00 pm, with Pastor Scott Ryder leading the celebration. Reception in the Funeral Home Reception Centre following the service.